ASTON VILLA’S NEW owners have given their backing to Steve Bruce, putting an end to speculation that Thierry Henry would replace the former Hull City boss in charge of the club. 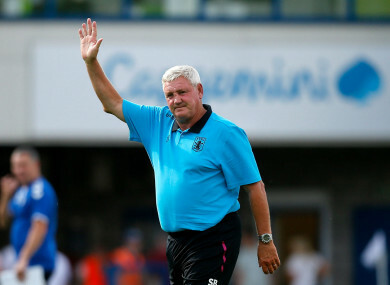 Bruce took control at Villa Park in October 2016 and guided the club to a mid-table finish in the Championship. His first full season in charge almost brought a return to the Premier League as Villa reached the play-off final, but his side were beaten 1-0 by Fulham at Wembley in May. That failure – combined with financial uncertainty – had led to some reports that Bruce would leave the club, with Henry said to be the man set to take his place after the Belgium assistant announced he was to focus on management. However, Villa investors Nassef Sawiris and Wes Edens have shown faith in Bruce after a meeting with the former Manchester United centre-half. “Aston Villa can confirm manager Steve Bruce has met majority owners Nassef Sawiris and Wes Edens and will continue as manager with their full support,” Villa announced in a short statement on the club’s official website. Email “Villa quash Thierry Henry speculation by showing support for Bruce”. Feedback on “Villa quash Thierry Henry speculation by showing support for Bruce”.